Vertical panel saws provide a space saving solution for many manufacturers, enabling large sheets to be processed in a very limited space. 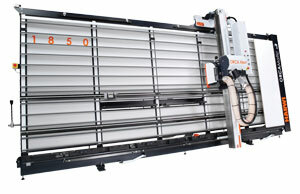 Modern machines offer the option of scribing which permits melamine faced panels to be cut without break out. The Harwi range offers options to suit most applications with transport rollers to assist the movement of heavy materials such as MDF by a single operator. An intermediate fence set at a convenient working height reduces the amount of bending down which reduces operator fatigue. Machines can be supplied with integral extraction eliminating the need for separate collection units, again offering benefits for those with limited space.